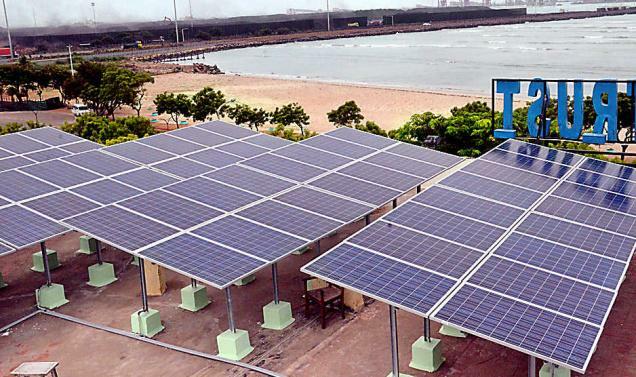 As per the latest press release of V.O.Chidambaranar Port Trust at Tuticorin, it has signed a deal with Solar Energy Corporation of India (SECI) for installation of 5 MW direct grid connect type solar power plant. Solar Energy Corporation of India (SECI), a central public sector enterprises under MNRE, has been implementing various schemes to develop solar sector in the country. The solar project will be built under Power Purchase Mode at an estimated cost of Rs. 30 crore by the SECI and target completion by March, 2017, reports ET. The expected annual power generation from the 5MW solar power plant will be 7.5 million units per year. Reduction of carbon emission by this project will be 8,025 metric tonnes per year, says press release. As a part of Green Port initiative, V.O.Chidambaranar Port Trust , has already commissioned a 100 KW solar power plant at the roof top of the Administrative Building of V.O.Chidambaranar Port Trust on 14.08.2015. The annual power generation of solar power from this 100KW solar power plant is 1.70 lakhs units. Another 400KW Solar power plant is under installation on the roof top of various buildings of V.O.Chidambaranar Port Trust and expected to be commissioned during the month of October 2016. Expected power generation from 400KW solar power plant is 6,80,000 units per year.